8" 18lb UV Black Nylon Cable Tie with Stainless Steel Locking Device 1,000/bag Specifications: Length: 8" Width: .10" Tensile Strength: 18 lbs Bag Quantity: 1,000 Material: Nylon 6/6 with Stainless Steel Locking Device Manufacturer: Thomas & Betts Brand: Ty-Rap Features/Benefits: • Features Nylon 6/6 Cable Ties with Stainless Steel Locking Device • Temperature Rating: -40°F to 185°F • UL Rated: UL9C45/Type 21 • CSA: Type 21 • Flammability Rating: UL 94 V-2 • Made in USA • Curved tip for easy threading and handling • Plenum Rated • Versatile cable ties can be used in countless applications • One-piece construction for consistent performance and reliability • Lowest threading force of any one-piece cable tie in the industry • Easy to Install — Won't Slip • Low Profile Head — Won't Snag • Stainless Steel Lock Maintains the Right Tension • Smooth Molded Body — Less Stress Sensitive than Notched Ties • Infinitely Adjustable Design So Always the Right Size and Bundle Tightness UV Black Cable Tie Benefits: • Greater resistance to damage caused by ultraviolet light – indoor or outdoor use. • UV Black Nylon 6/6 is used in continuous or extended exposure to outdoor sunlight. • The nylon cable tie is a weather resistant grade, enduring additional ultraviolet (UV) light. • This grade is produced by incorporating stabilizers in the nylon resin. 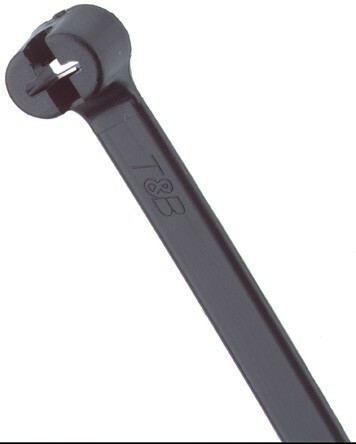 • UV Stabilized Nylon cable ties are available only in black and other select colors of Ty-Raps from Thomas & Betts.